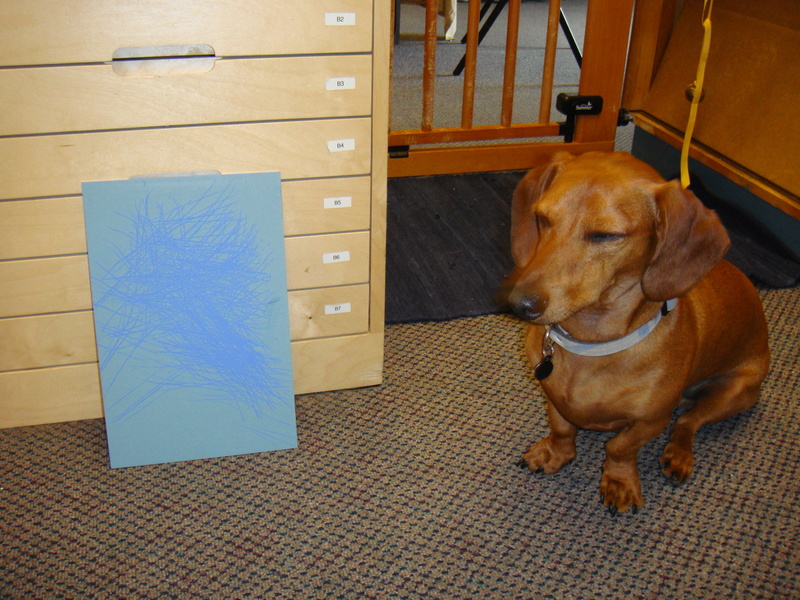 Ammo the Dachshund has a new work of art available in the shop. Click here to visit his blog and read all about his new masterpiece. Titled, “Stormy Sea” this original watercolor painting is available for purchase in our shop. Click here for more information. And as always, we donate 5% of all painting sales to charitable organizations such as the main line animal rescue, spca, and the coast to coast dachshund rescue. Around Painting Pony we’re known for our three talented painting Chincoteague Ponies. Minnow, Blitz, and Boomer all hold paintbrushes in their mouths and paint onto canvases while standing at their easel. Since November of 2008 they have had a special sidekick, Ammo the Dachshund. Ammo has lived in their shadow for the past two and a half years. He gets toted to horse shows, brought to performances, and lugged to the farm where they live. Don’t get me wrong, he loves all of it, especially the visiting the farm part. In fact, he’s formed unusual relationships with all of the ponies, as I frequently catch him playing with them in the pastures. But if you have been following this blog, you know that I have decided to let Ammo come out from behind their shadow by helping him develop his artistic talents and learn to paint. We have been working almost daily on honing Ammo’s talents as a painter. While Ammo is getting closer to creating his very first painting, we are still working on distinguishing between the handle and the bristles. I’m sure it won’t be as fun to jam the bristles in his mouth when the paint is applied! So, in the meantime I decided we would embark on some other artistic endeavors. In his case, scratch art. For Ammo’s graduation from training class I taught him a new trick, to dig on command. It was quite funny actually, I used a matboard marker and taught him to target his feet to the mat. I then enticed him to dig at it (natural to the burrowing Dachshund), and then gave him a command for it. Ammo thought the whole thing was quite fun, and we routinely practiced every morning before opening the shop. 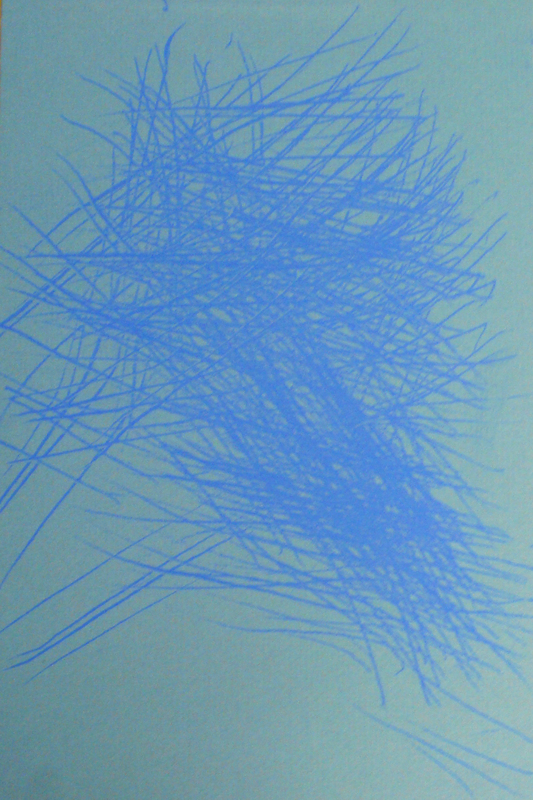 Suddenly I had an idea – we should try making some scratch art with his new found skill. First scratch art painting. Its so beautiful I can't even look at it! So today I attached some transfer paper to piece of matboard and set out to see if Ammo would like to create a scratch art painting. 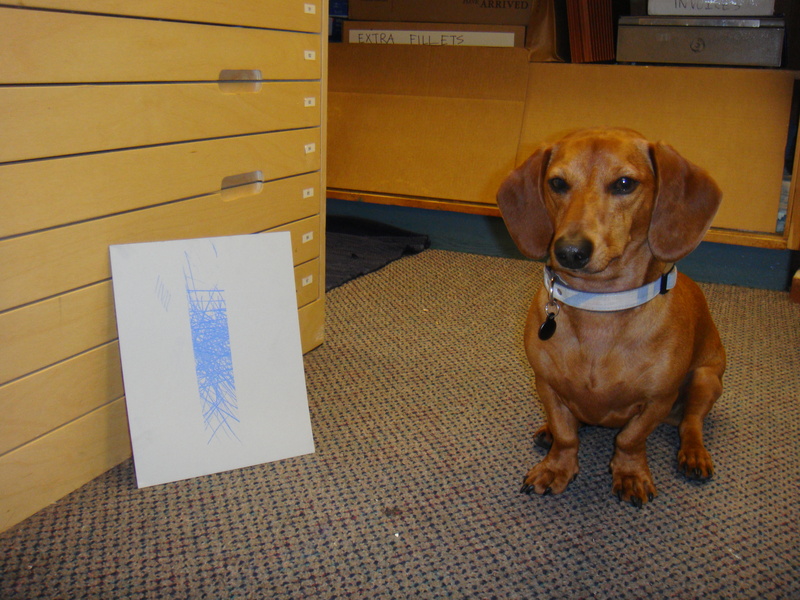 As you can see he was very proud of his very first work of art. The Dachshund was more than disappointed when we had to stop for the day, so I’m sure this will be the first of many scratch art paintings for the little guy. I’ve been scheming up some more creative ways for Ammo to get his scratch on, so be sure and stay tuned to see what he will create next. I will post a video of Ammo “scratching” soon! So what do you think? Is his masterpiece fridge worthy? Would you hang it on your wall? Excited to see more of his scratch art talents?